Take your company name to new heights! This innovative new floating billboard is helium-filled and has 1300 to 16,000 watts of glare free light. 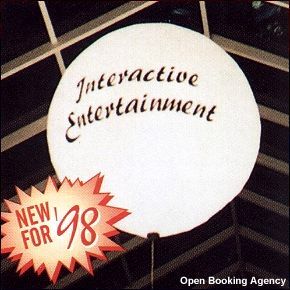 Custom logos, slogans or graphics provide a unique advertising medium or indoor special event lighting. Dimensions range from 6 to 16 feet in diameter and can be tethered to rise 20 to 50 feet above the event. Great for any event or trade show.